Following its launch on 1 July 2017, CISRS Continuing Professional Development (CPD) training has got off to a flying start. With the help of four accredited training providers – LTC Training Services Ltd, National Construction College, Safety and Access Ltd and Simian Skill Ltd – six funded courses were offered across the UK at centres located at Inchinnan (near Glasgow), Immingham, Warrington, Bircham Newton, Erith, and Plymouth. Places were offered free of charge on a ‘first come, first served basis’ to scaffolders and advanced scaffolders who need to renew their CISRS cards before the end of this year, and around 70 operatives snapped up the places. The courses proved to be a huge success and attracted delegates from across all sectors with those in attendance working for large companies such as Cape, Wood Group and Interserve, to those working for smaller roofing and scaffolding companies, to those who were self-employed. CISRS cardholders are given six months’ notice prior to their cards expiring and can renew at any point within this period. The feeling amongst the providers was that the numbers of those attending CPD training in 2017 would be relatively low as many will have taken advantage of the six-month window i.e. cards expiring in December 2017 could have been renewed in June 2017 with only the CITB H,S&E test, prior to the 1 July deadline. There has been an increase in card renewals in the first half of the year but not as large as had been expected. As with any change to a scheme requirement, it was felt that CPD may take a while to bed in, however several centres have reported a good response to its introduction and are arranging for additional courses to take place in order to meet demand. 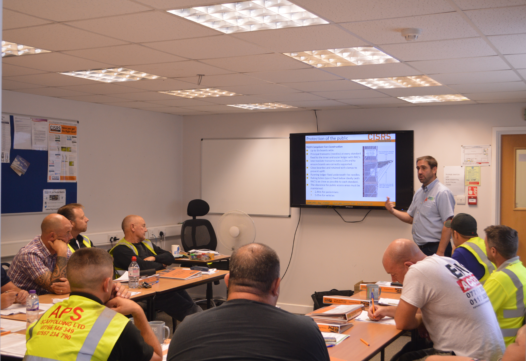 The aim of the CPD course is to ensure that all scaffolders and advanced scaffolders are up to date with the latest legislation and industry guidance at the point of card renewal. There is a range of information which is relevant to all elements of the scaffolding sector. As with all CISRS programmes the course will be reviewed periodically to ensure it remains relevant. The CPD courses will usually cost around £250-£300, however several of the CISRS providers are currently running introductory offers and keeping prices lower than this. All companies paying CITB levy will be able to claim attendance grants of £50 per day for those completing CISRS CPD. NASC has set up a funding programme of £50K which will offer an additional £125 for member companies who support their employees and renew their cards through the CPD process. For a full list of CISRS training providers offering CPD please visit www.cisrs.org.uk.